Hello everyone! 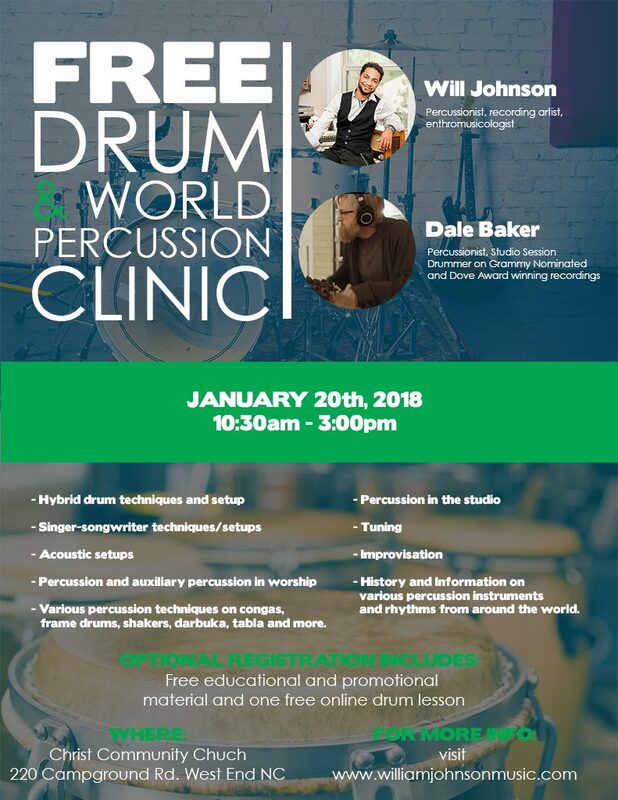 I am very excited about this upcoming drum clinic with my friend Dale Baker (Six Pence None the Richer, and many other notable producers, artists, and bands). The clinic is free, however there is an optional registration which includes educational resources, promotional material, and one free online lesson. To register online click the following “Add to Cart button. You may also register on the day of the clinic. 10:30am-11:15am – Children’s session: Basic understanding of rhythm and percussion. Simplified music explanations and engaging rhythmic games. 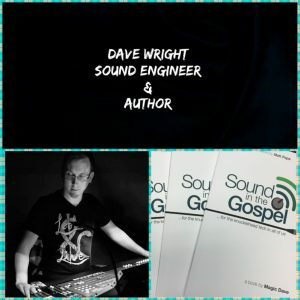 2:45pm-3:15pm – drums in the Live performance with sound engineer and author (Sound in the Gospel) Dave Wright. 3:15pm-3:30pm – Performance jam by clinicians. Dale Baker. 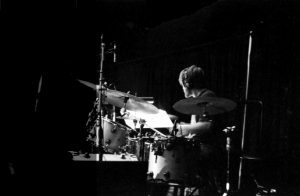 Drummer on top billboard charted hits such as Six Pence None the Richer’s Kiss Me and There She Goes. Dale is an accomplished session drummer, producer and recording artist that has worked with iconic producers and musicians throughout the country. 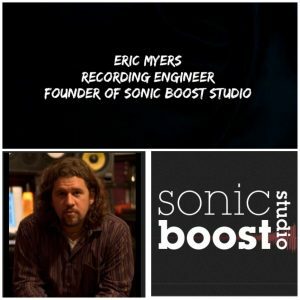 Eric Myers. An accomplished recording and live sound engineer with over two decades of experience in studios across the country. Eric has an impressive resume and curates a growing library of tools and tricks of the trade. More information on the clinic will be added in this post soon! A few months back I had the wonderful opportunity of assisting in worship on percussion for the Campbell University’s School of Divinity Chapel. Prior to arriving on campus that morning I actually thought it was for the freshman. I was pleasantly surprised to discover it was actually for the Divinity school (I do love doing the freshman chapel service as well however). Leading in worship (musically) was a good friend of mine and anointed musician Giles Blankenship. Giles has a unique way/gift of making you feel very comfortable in worship and the presence of the Lord. To discover his music or learn more about him visit www.gilesblankenship.com. I absolutely love worshiping with him. For the set I brought a cajon, foot pedal with tambourine bracket (I find this goes great with “CCM” type songs especially during the chorus), shakers, brushes for additional effects on the cajon, one conga, and some rattlers. It was an intimate service that I will most certainly not forget! Also I had an opportunity to play again with one of my favorite guitarists Kyle Johnson. Kyle is on electric guitar on my latest project Flor de Vida. The Campbell Chapel is an amazing venue. If you are ever near the campus you should stop by and check it out. The combination of cathedral ceilings, cedar wood beams, tall clear glass pane windows and stained glass make for a breathtaking view during the day from inside the chapel. The chapel is literally flooded with light during a clear sunny day. 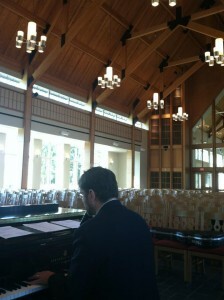 It was so beautiful to play those slow worship songs and to look out and see the light breaking through the room… breathtaking… Above is an actual photo from a rehearsal prior to the service. 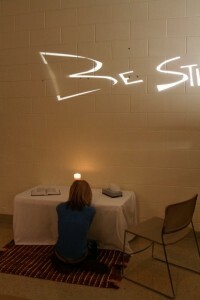 I will never forget spotting a young lady sitting by herself meditating during the worship while we ministered in song. I love experiencing moments like that. It has been far too long since my last blog post and for that I am deeply regretful. I have so much to catch up on. I would like to start with my last event and perhaps work my way backwards to the Heartbeat for Worship 2010. Thank you in advance for reading this post! Last Sunday was an amazing day. I started with a beautifully blessed morning with the family and of course Sunday morning worship at OCM ministries. I have this image of a brother in worship who happened to be directly in front of my line of sight… or maybe my spiritual sight… either way it was beautiful. The image haunts me, in a good way, if that is possible. Just to see witness a soul pour out to God is the most precious and beautiful thing. Sometimes I feel like the most priveledged person in the world when I am able to witness such an event taking place. During the evening there was an acoustic hymn set on a separate stage with just a few of us. It was myself on cajon (box drum) some shakers and a tibetan hand chime, Giles and Kyle (acoustic guitar), Lauren and Erica on background vocals, and one song with Marla Finn on saxophone. That was a very special time. There was a couple moments I just wished it would never end. I only rehearsed the songs once with them yet the Holy Spirit was so strong upon me I felt like I knew the song in and out. That what my view and perception from the stage is like. Although there are so many moments where I am carried away, my playing and worship is also inspired by others in the audience who get lost and found in Jesus. With arms stretched wide an open hearts, this is truly some great stuff that the kingdom is made of. I will keep this one short guys. Until next time… be blessed!